Independent perfumer Dawn Spencer Hurwitz recently launched two new floral fragrances, Peony and White Lilac. I have to confess that I don't always stay abreast of this line's new releases and projects, only because Hurwitz is quite prolific and the line is still primarily online-only, so I was happy when these two samples came my way. In case you were wondering: no, I will never tire of feminine floral perfumes! Peony is an evocation of an entire day in the life of this springtime flower, from a dewy bud at dawn to a duskier blossom at nightfall. In addition to peony, it includes additional notes of bergamot, Tunisian neroli, petitgrain, Bulgarian rose, Russian rose otto, Egyptian rose geranium, violet leaf absolute, green oakmoss, orris, East Indian patchouli, tolu balsam, ambergris and Australian sandalwood. As you can guess, the fragrance unfolds from a citrus-tinged opening to a heart of peony and slightly musky rose, gradually reaching a woodsy-mossy dry down still strewn with floral petals. Thinking back to some other peony fragrances of recent years, it's more natural-smelling than Jo Malone Peony & Blush Suede; it has more in common with Penhaligon's Peoneve, but it feels more hand-crafted and more gracefully composed. White Lilac is also spring-oriented, and it describes lilac well as "moist yet airy...fruit-nuanced...with the classic honey-floral drydown." It includes additional notes of ambrette, neroli, apple, clover leaf, violet leaf absolute, beeswax, honey and musk. I rarely wear lilac perfumes (En Passant being the notable exception) but I enjoyed this one, even if it's not as "me" as the Peony. This lilac has a fruity aspect from the apple and ambrette notes, and an almost humid feeling, as though it were subtly giving off pollen and nectar. It comes on more aggressively that I might have expected — it's ladylike, but not shy — and even when it softens a bit and its leafy and musky sides come out, it keeps its distinctive floral notes. If you're a lilac fan, you should certainly try it. Peony and White Lilac are both very feminine soliflores that stay true to their floral inspirations. They also both have very good staying power (Peony, in particular, still clung to my skin after eight hours of wear). I enjoyed spending time wrapped in their essences this week, and now I'll remember to check the Dawn Spencer Hurwitz website more often and to place more regular sample orders. Peony is available as 1 dram ($21), 10 ml ($35), or 30 ml ($80) Eau de Parfum. White Lilac is available as 10 ml ($33) or 30 ml ($70) Eau de Parfum and as 10 ml Essence Oil ($52.50), with matching body products. For buying information, see the listing for Dawn Spencer Hurwitz under Perfume Houses. Note: top image is Watercolor SL [cropped] by hurley.k.e. at flickr; some rights reserved. Love, love, love peonies! My absolute favorite note in a fragrance! Jo Malone’s Peony and Moss (was a limited edition) was my favorite peony fragrance ever. When I could no longer find it, I started using Jo Malone’s Peony & Blush Suede. This one is nice, but was no where near as good as the P and M. Since the DSH Peony has a “mossy-like” dry down, it may be similar to the Jo Malone. Jessica, did you ever get a chance to try the Peony and Moss from JM before it went away? Wondering how you think it would compare to DSH. Out of curiosity, have you tried Charlotte by Sweet Anthem? I’m not sure I’d call it a peony perfume, but it’s got a good heart of peony, and it’s one of my favorites from that brand. I missed Jo Malone’s Peony and Moss!! Some of those limited editions vanish before I can track them down. (Remember the teatime trio? or the dessert scents?!) And I still haven’t tried anything from Sweet Anthem. Someday I need to order a sample set, if she offers them. The dessert scents didn’t last for long. They were too sweet for my liking. The London Rain series is gone as well. They come and go so quickly. No, I haven’t tried it. I will add it to my list. Thanks for the suggestion! I’m glad you reviewed this! I love real lilacs but have not found the perfect lilac perfume yet. Puredistance Opardu is close, but Puredistance I was the one I finally decided on from that line. I have a couple of those tiny Ma Collection set bottles of Jean Patou Vacances, and I suppose they might yet reissue it. I’m looking forward to trying White Lilac to to see how DSH handles it. So many of those Ma Collection fragrances were great! I’m waiting to hear more about the reissues, too. I am LONGING for Patou to reissue Vacances. It’s so beautiful. Much, much greener and airier than White Lilac, but I could handle having both. We were recently at Kingsbrae Garden in New Brunswick. They have a long path that is lined with peony bushes. They were in bloom and sprinkled with sparkling raindrops. So beautiful! I could not stop snapping photos. I love lilac in perfume. Thanks for the review. That sounds gorgeous. My grandparents had a few peony bushes growing next to the patio in their backyard, so I always associate peonies with certain memories of being there. It’s a happy flower. They were my maternal grandmother’s favorite flower. They don’t grow them where I live, so it’s nice them bursting forth in “vegetable profusion,” to quote “Housekeeping” by Marilynne Robinson. I love love love lilac perfumes, so I’ll have to give this one a shot! Peony, too, but lilac is my first love. Thanks for the reviews! Lani, if you love lilac scents, you should definitely order a sample of this one!! These both sound awesome. Must try them. Thanks for the reviews! P.S. I never tire of feminine florals either! You are welcome! and I’m sort of predictable, but I do love these kinds of fragrances. You and I share some similar tastes, Jessica, so I’m not surprised you liked these. I bought a small oil rollerball of White Lilac a few years ago, the first time it was released, and it’s really lovely. Sweet, yes, and I could wish for a few more green touches (I love my greenies), but it’s a lovely lilac scent that doesn’t smell like air freshener. I have a sample of Peony awaiting trial. 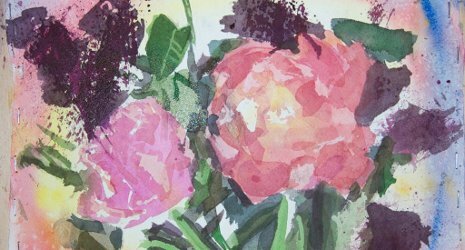 Peonies are another favorite of mine – I adore the light pink Sarah Bernhardts and have an enormous bush in the front yard that really should be divided because when it blooms out the flowers weigh down their stems. It’s my sister’s favorite flower, and it blooms near my daughter’s birthday, and both my grandmothers adored peonies (my one grandma called them “pinies,” mountain style), so it’s a flower that says FAMILY to me. Besides which, they truly are gorgeous. Unfortunate that the petals can’t be saved like roses. I did really like the LE Jo Malone Peony & Moss, which I nabbed a sample of and enjoyed. MDCI Rose de Siwa is another fragrance that is strongly peony to my nose; with rose, yes, but my Sarah Bernhardts are rather rose-inflected so I never mind a rose-peony scent. I had a teensy sample of Rose de Siwa once, and I did enjoy it! I’m also trying to remember… I think I also owned and loved a bit of some Patricia de Nicolai rose-peony fragrance. Oh! — Rose Pivoine. For certain, two of my most favorite flowers ever. I grow peonies, a white one and a pale pink one, but no lilacs of any sort because my fella hates lilac… Except for a flowering housplant that he says smells of lilac, but I don’t think it does. I usually prefer smelling real lilac flowers to lilac perfumes… but this fragrance is very nicely done! Would like to ck this scent out, thanks Jessica!